It is time to turn on your heart light and this project is sure to be a hit around the home, studio, or office. I have created this festoon using fabric, but you could also do one using pretty pattern papers. (1) Cut out craft batting in Gothic Arch Shapes. Add a layer of lace over the body of the arch and stitch along top and bottom. (2) Cut out a piece of cheesecloth (rectangle shape) and add to center of arch. Cut a square of muslin or eyelet fabric and add to center. Stitch these two pieces in place with machine (or use Tacky glue). 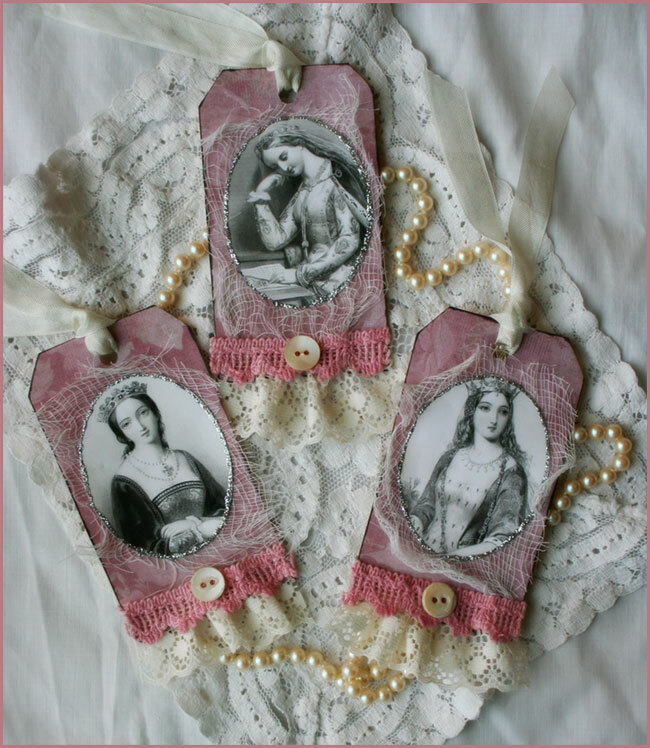 (3) Print out Royalty images and glue on to cheesecloth/muslin squares with Tacky glue. Place wax paper over image and set heavy objects on top to “flatten” the piece. Allow time for image to dry and set up. (4) Add Silver Stickles along the edge of image. Set aside while the glitter sets up and drys. (5) Sew pink lacy trim to top of arch and add pink beads by stitching into place. Trim off access on edges. (6) Add buttons and seed beads by hand stitching into place on arch. (7) Place arch on muslin or eyelet fabric and machine stitch around entire edge. Trim close to edge with pinking shears. 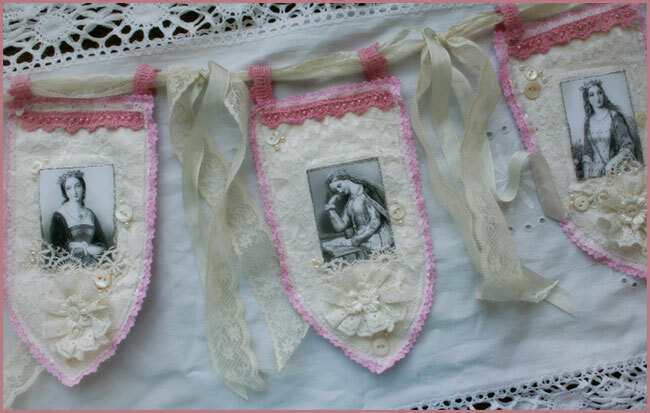 (8) Place arch on pink pattern fabric and machine stitch around entire edge. Trim close to edge with pinking shears. (9) Create lace rosettes by running a gathering stitch through lace. You want to create a “circle” with the lace. Once you have enough gathered, pull and tie ends. Stitch ends together to close off rosette. Add a button and flower to center. Glue in center of arch. (10) Stitch pink lacy trim in “loops” at the top of arch. Thread ribbon and lace through loops and tie ribbon strands to create garland for hanging. Sweets for the sweet? These little boxes can be filled with all sorts of treasures, treats and trinkets. Perfect as a small token of appreciation and who doesn’t love something with a surprise inside! (1) Paint inside and outside of paper mache boxes with craft paint. Apply 2-3 coats and let dry in between. (2) Add white or cream sheer lace to sides of box and lids with Matte Gel Medium. Allow time to dry. 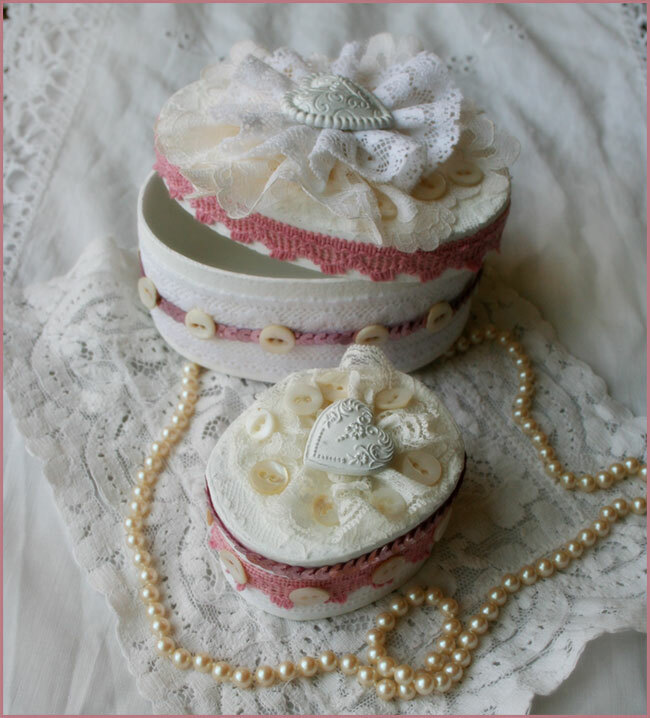 (3) Using E6000 glue, add pink scallop lace trim or pink sequin trim to sides of box. Allow set up time. (4) Add buttons or other embellishments to sides of box using E6000 glue. (5) Create lace rosettes by running a gathering stitch through lace. You want to create a “circle” with the lace. Once you have enough gathered, pull and tie ends. Stitch ends together to close off rosette. Glue to lid of box using E6000 glue. (6) Add hearts to center of rosette using E6000 glue. These little bits of romance are sure to be a hit and easy to make for loved ones, friends, co-workers, or someone who makes your heart go pitter-patter. I am using images from the Royalty collection, but you have oodles of Paper Whimsy images that would look smashing for this project. (1) Create a tag base using heavy cardstock and add pattern paper to the top. (2) Cut a piece of cheesecloth in a rectangle shape and center on tag. (3) Print out images in Microsoft Word and cut into oval shapes. (4) Glue images down using tacky glue and place heavy objects on images until they dry. If you place a bit of wax paper over image it helps protect the object you will be using. (5) Apply Silver Stickles along the edge of image. Allow time to set up and dry. (6) Glue layers of lace to bottom of tag. Allow time to dry. (7) Punch hole and tie ribbon through the top of tag. How beautiful! All these elements and textures. Oh Nancy, this pretty in pink is getting me in the Valentine mood! Just sweet and romantic! LOVE it all! Ooh, Nancy! Sweet, pink confections, all of them! LOVELY . . . BEAUTIFUL!!! I love what you did here my talented friend!!!! :D Stunning work! Oh Nancy triple inspiration today. Thank you so much for sharing and thank you for visiting me and leaving a lovely comment. Beautiful creations this you made at new year Nancy! Wow wow wow wow wow nancy so wonderful new projects. All are so lovely. Gorgeus play with PW. I love your Queen of Hearts Banner! Just the think for Valentines day – and all the pink and white cottages! Oh so lovely each and every one! 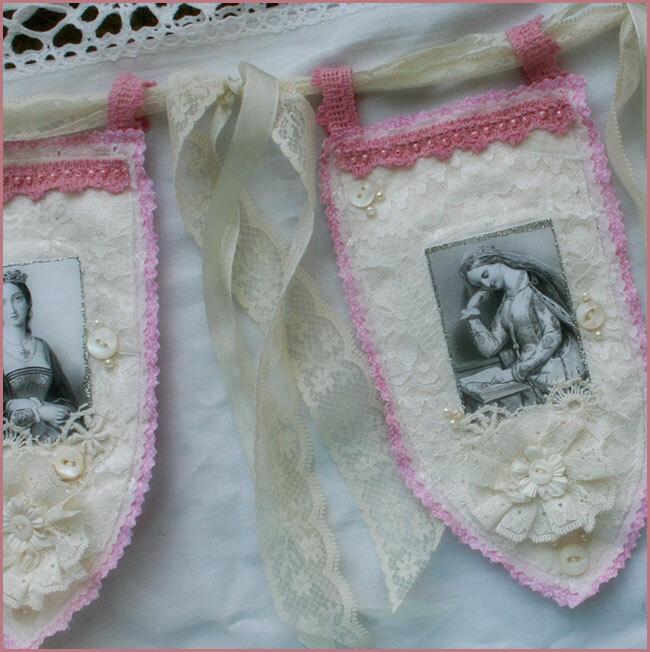 Dearest Nancy, I love your beautiful queen ideas, tyhe banner and tags are both so romantic and so lovely, with the black/white images, and the wonderful old rosa colours you used- Love the box as well- the wseetest with the heart and buttons. Thankyou ,and a happy sunday, to you dear. Love!!! Love! Love!! There are truly gorgeous!! I just love the unique style of the banner and the old world printing…. Beautiful creations as always Nancy! These are all wonderful, Nancy!!! You inspire on so many levels Nancy.